With less than two weeks remaining before Samsung's next flagship phone is unveiled in London, it seems we're beginning to see the start of the marketing campaign for the device. The image you see above comes from tgeltaayehxnx.com, the address of which is an anagram of "The Next Galaxy". The URL was first outed in a tweet from Samsung Mobile earlier today. And the page's title refers to a "whole new universe", with additional clues hidden in the page's metadata -- "Discover how Samsung is about to challenge the way you view the GALAXY once more." A quick WHOIS lookup for the domain reveals it's owned by marketing agency The Upper Storey, which has been involved in campaigns for the likes of Nokia, Intel and LG in the past. 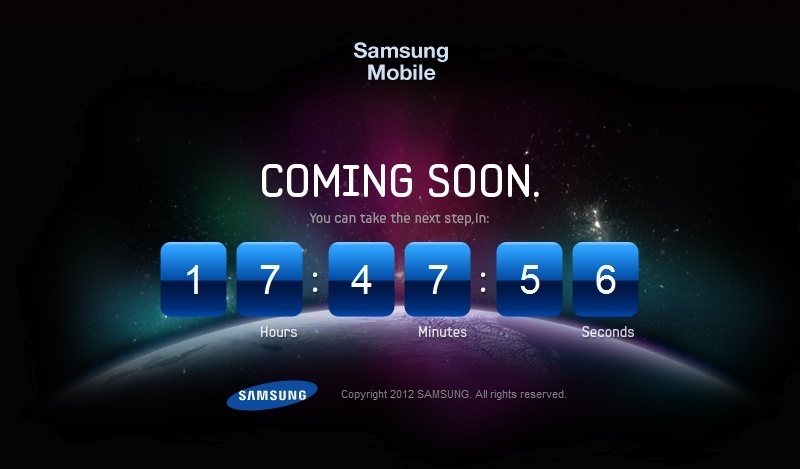 The agency has also registered thenextgalaxy.com, an unscrambled version of the URL above. That site is currently password-protected, however. The focus of the teaser site is a giant clock counting down to 12 noon UK time tomorrow, April 23 (7am EDT, 4am PDT). With the London event still a good 10 days away at that point, it's unlikely we'll see an official announcement, but some more clues about the Galaxy S III next Galaxy could be unveiled. One thing's for sure -- we'll be watching with interest come noon tomorrow.